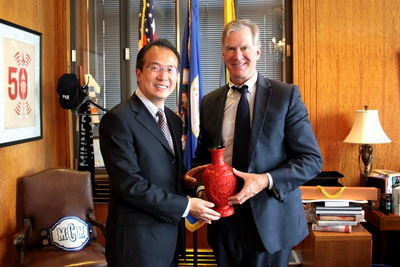 On October 6, Consul General Hong Lei met with Mayor Christopher Coleman at the City Hall in Saint Paul, the State Capital of Minnesota. Consul General Hong Lei said that he is happy to visit the beautiful city of Saint Paul. Currently trade and investment cooperation between Minnesota and China continues to expand, multinational companies such as 3M enjoy sound business development in China. Meanwhile, more and more Chinese enterprises and students consider Minnesota as their destination in the US for investment and study. The sister-city relationship between Saint Paul and Changsha, Hunan Province enjoys good growth. As China's economy continues to grow rapidly, there will be more opportunities for cooperation. The Consulate General is ready to work with the city government of Saint Paul to actively deepen mutually beneficial cooperation and exchanges between the two sides. Mayor Coleman welcomed Consul General Hong Lei and said that in this global village, the relationship between the US and China is very important. He spoke highly of Saint Paul's cooperation and exchanges with China and said that he was deeply impressed by China's development during his two visits to China. Maintaining a good sister-city relationship with Changsha, Saint Paul would like to be the gateway for Chinese enterprise to enter the US, especially the Midwest and welcomes more Chinese investment. Saint Paul is also rich in educational resources and welcomes more Chinese students to come to study.